To many people, Corporate Social Responsibility (CSR) is an empty buzzword. It’s the window dressing big companies put on their business to make it look like they’re giving back: A bit of money to charity, a volunteer day here or there to paint a community center. Then there are programs like LinkedIn For Good, the social media giant’s CSR program. Their newest initiative, a Volunteer Marketplace, redefines what CSR is and can be. Allowing LinkedIn users to search for volunteer opportunities, this initiative was built in response to nonprofits’ needs for volunteers to fill much needed roles. This is a perfect example of how LinkedIn is delivering on their mission to “connect talent to opportunity to make a positive impact.” Their program is just an extension of who they are and what they do best. As LinkedIn shows, CSR can be much more than a just a gloss applied to business efforts. It can and should be a fundamental part of a company’s DNA. Understanding the significance of this shift requires a bit of history. Despite consumers’ expectations of businesses to be both profitable and socially responsible, CSR isn’t always adopted by the entire organization and often sits siloed in one department such as HR or Marketing, isolated from the rest of the company. It may collect food for the food bank or sign up employees to spend a Saturday at a soup kitchen—all great things, but not central to the business. However, in order for CSR to truly be adopted company-wide, it needs to be a part of the company’s overall strategy. Luckily a trend is emerging of companies doing just this and making social responsibility the obligation of every department and every employee. One trend that is influencing this movement of CSR from the remit of one person to an entire company is the increased value placed on intrapreneurs. Intrapreneurship is the “successful adaptation of entrepreneurial attitudes and strategies inside of a bureaucratic organization”. A social intrapreneur takes intrapreneurship and applies it to promote practical solutions to social or environmental challenges. We have many examples within HootSuite of passionate individuals taking the initiative to tackle problems they recognize need solving. Take Saba El-Hilo, one of our software engineers. Everyone talks about the need for more female developers, but not as many take action. Saba created the group Girl Dev with the vision to increase the amount of women working in software development. The other major reason for the adoption of CSR company-wide is a practical one. It is impossible for a centralized CSR team to truly understand what is going on at a departmental level. In HootSuite’s case, we are experiencing explosive growth, adding up to twenty new employees a week. Therefore it’s important that evangelists in each department are empowered to give back to their community. One way HootSuite has enabled this is through monthly themed parties called Parliaments. Each monthly Parliament is organized by two different departments that normally wouldn’t work together. One of the measurements of success of these events is their contribution to the community. The most recent one, #HootNoir a black-tie, three-course dinner complete with live entertainment raised $1,500 on behalf of Saint James Music Academy, a music program that teaches classical music to children living in Canada’s lowest income urban neighbourhood. As the person leading CSR at HootSuite, my role is to see our business through the lens of social responsibility and leverage our influence to affect positive change. If I think about what ultimate success looks like for me, it would be to put myself out of a job. My team is made up of passionate employees from HR, Marketing, Sales, Business Development and Product. Some initial projects we’ve started include working with our Community team to bring together nonprofits using social media in an online community, giving them a platform to ask questions and share best practices. This will also allow us to better connect with our nonprofit customers and provide them with a direct channel to communicate their requirements. As CSR becomes increasingly part of a company’s overall strategy, our aim should be to make our role redundant. The objective being to make social responsibility ubiquitous, and to inspire our colleagues to look for ways their work can have a greater impact than just revenue. As the leader of Hootsuite's Corporate Social Responsibility program, Aki is passionate about how business can be a force for good. 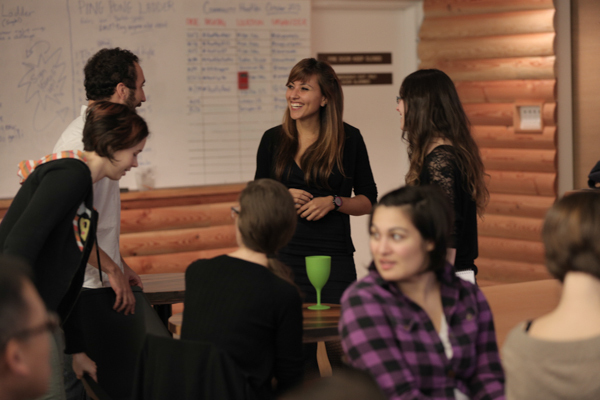 She writes about volunteering, #BCorp and the #HootsuiteLife.